DOM CASIMI - Your new home! 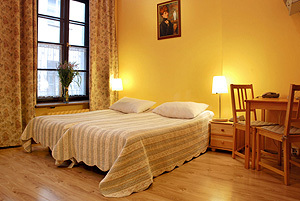 The âDom Casimiâ Hotelâs location is extremely convenient for all the visitors to Cracow. It is situated in the heart of Kazimierz (Casimi in Latin), which was established by the Polish king Kazimierz in the 14th century. 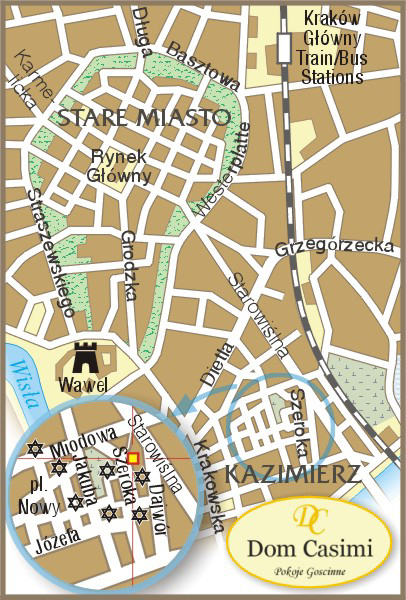 It later became the Jewish district, and Szeroka Street was in the real heart of it. The picturesque old streets of Kazimierz appeared in the famous movie âShindlerâs listâ by Steven Spielberg.Â We strongly believe that our hotelâs unique atmosphere, professional staff and comfortable rooms will make your stay unforgettable and you will return very soon and even recommend us to your friends. 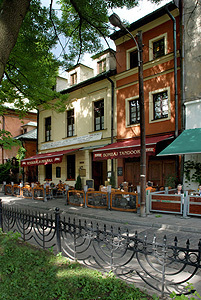 Dom Casimi is situated in the heart of Kazimierz the old Jewish district within walking distance from Cracowâs Main Market Square and the Wawel Castle. It is also minutes away from good theatres, museums and many other interesting places in Cracow.Dom Casimi offers its guests the convenience of being close to the Main Railway Station, bus station andÂ the biggest shopping malls in the centre of Cracow.This makes the location of our hotel one of the most desired by all kinds of visitors. We have a conferenceÂ room for up to 16 people. Dom Casimi is located 0,5 km from the city center, 3 km away from the main railway and busstation.